For the ultra-organized and extreme bibliophiles comes an app that will satisfy the librarian in you. Behold: Guillermo Gonzalez’s BooksApp, here to help you catalog and keep track of your personal library. There is a six-minute introductory video in the Settings, but most of the app’s functions are pretty self-explanatory. If you are the owner of an iPhone, be sure to turn on the barcode scanner, also in Settings (only ISBN-13 barcodes will be recognized). The first tab, Books, will list all the books you’ve entered, either by scanning barcodes or keying in ISBN numbers, titles, or author names–only 10 books can be scanned at a time. Book information is pulled from Google Books and Google Products, but if the book cannot be found, you can also choose Add Blank Book and key in the information yourself. Books will be listed alphabetically; you can browse by authors by going into the Authors tab, in which they will be listed alphabetically. 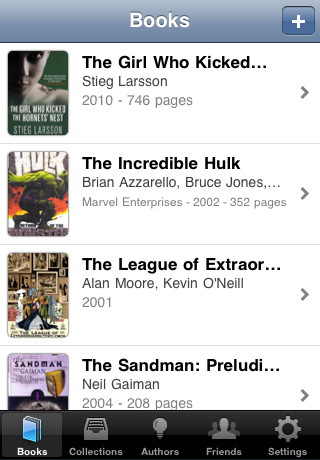 Choosing a book from either Books, Collections, or Authors will take you to a detailed page about the book. You can edit any of the information, even the cover, and if you make a mistake, just shake your device for a chance to undo it. Tapping on More Info will take you the book’s Google page. A neat function of BooksApp is the option of Lend To A Friend. Tapping that will allow you to choose a friend from your device’s Contacts list as well as setting a due date–it’s like having your own personal library system. You can also export your list of books into Google Documents, which is found under Settings, so make sure you have a Gmail account handy. BooksApp might not be the prettiest utilities app around, but oh baby, does it get the job done! It is extremely efficient, streamlining what would be a laborious cataloging process and displaying all the pertinent information. Now you can carry around your library in your pocket, and never ever accidentally buy a duplicate copy of something you already own (…that might be just me). One minor quibble I have is that there is no landscape orientation–if I’m typing in hundreds of titles on an iPod Touch, I want to do it as fast and as error-free as possible. Also, perhaps more options for the ordering of the book list would be nice. A great book is one to be shared, a sentiment that the developer seems to agree with. Wannabe librarians and compulsive organizers, run, don’t walk–for $1.99, BooksApp is a steal. AppSafari review of BooksApp was written by Julie Guan on July 1st, 2010 and categorized under App Store, Books, Featured, Reading, Utilities. Page viewed 5513 times, 2 so far today. Need help on using these apps? Please read the Help Page.